Papa Steve & Nienna Handcrafted: Why does my skin turn green when I wear my copper jewelry? 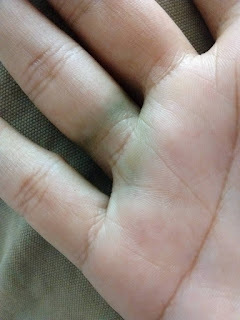 Why does my skin turn green when I wear my copper jewelry? ABOUT COPPER LEAVING A GREEN DEPOSIT ON THE SKIN…. When it is exposed to air, it darkens or tarnishes, forming what is commonly referred to as copper “patina.” After prolonged contact with human skin where it can interact with air, sweat and other chemicals, such as soaps, lotions and makeup, copper can turn green or bluish-green, and stain the skin in the process. Well, this occurrence may or may not happen because it is related to the wearer’s metabolism. The green stains are caused by copper oxidation when in contact with sweat glands. Therefore, if you sweat profusely when working out, or gardening in the sun, maybe it’s not a good idea to wear your copper jewelry. Copper oxidation can also occur in an acidic environment. Your body acidity is related to your diet. Junk food, processed food and lots of red meat will make your body acidic. Fresh fruits and vegetables won’t. That said, people’s reaction to copper cannot be predicted. By the way, copper is a material used in many alloys like bronze, brass and sterling silver. And yes, in extreme cases, sterling can also turn your skin green and cause allergies! The green stains can be washed off with soap and water. Otherwise you will notice that they are absorbed overnight by your body. You may attempt to prevent your skin from turning green by applying clear nail polish to the side of the copper that touches your skin. You will have to reapply as needed when the coating wears off. It's a fact that our body needs copper and can get it from food like milk, nuts, seafood and delicious chocolate. If you wear copper jewelry and it leaves a green deposit, your body will also absorb it and put it at good use. So I see that as a plus. Fact: Copper is an essential mineral that is absorbed through the skin. Some believe that this natural invisible process becomes visible when we experience physical, emotional or mental stress. If this is true, then turning green may be an early stress indicator and could be one of the reasons that copper has been worn for ages around the world. Copper marks wash away easily, or you may allow it to be absorbed by your skin. - "Copper is an essential element for the enzyme that regenerates the cartilage lining our bones and to clean up the radicals destructive to human tissues." - Excerpt from the book: The Copper Bracelet and Arthritis by Dr. Helmar H. A. Dollwet, Professor of Biology, University of Akron, Ohio, USA. Spiritually, copper is also considered a metal capable of storing healing properties holistically, as well as having protective properties. This is why it was used in ancient times for totems and talismans. So you see, Copper has been used for medicinal purposes in Ancient Egypt, Greece and even by the Aztec civilization. Hippocrates himself mentioned copper as a treatment for leg ulcers. Could it be that doctors today prefer to prescribe expensive pills (and fuel the multi-billion drug industry) rather than recommend a natural and affordable alternative? Or, is copper really an old school remedy? Who knows, I say do what works for you. If wearing copper helps whatever ails you, go for it!